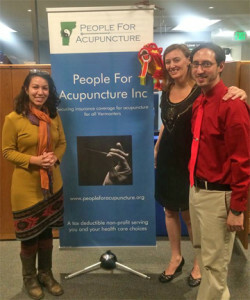 Representatives of the recently formed Vermont advocacy group People for Acupuncture, testified in early February before the Senate Health and Welfare committee on their bill H.573. PFA leaders Kerry Boyle Jenni, LAc and Joshua Singer LAc at right, with 2016 Lt. Gov. candidate Kesha Ram. She said a similar discussion is taking place in the House Health Committee, whose chair is a main sponsor of their bill. The bill would take effect as early as Oct. 1 of 2016 and no later than Oct. 1 of 2017.